Many sleepers find it difficult to sleep through the night due to overheating. This isn’t just an annoyance that can cause one to wake up from time to time; it can also prevent the body from its natural process of dropping its temperature during sleep. If this doesn’t happen, other physical and mental benefits of sleep may not occur either. Many sleepers who encounter this problem invest in a cooling mattress, but the solution may be simpler. About 10% of body heat is lost through the head, so a dense or stuffy pillow can contribute greatly to heat retention. A cooling pillow can increase comfort and improve the sleep quality of those who suffer from sleeping hot or waking up sweaty. To create this guide to the best cooling pillows, we’ve researched all the top brands and studied real customer input. Our experts have tested the durability and effectiveness of each product and compared them with the manufacturer’s specifications to guarantee a thorough assessment. Find our top picks below. There is a lot to learn when it comes to choosing the right pillow. To find out more about pillows in general, check out our complete Guide to Pillows. If you are considering a cooling pillow but have other needs as well, such as spinal support or tension relief, you may want to read our guide to the Best Pillows. Cooling pillows are not all the same. They are designed primarily to eliminate heat, but most seek to provide other elements of comfort such as support, firmness, and moisture control. For this reason, cooling pillows come in a number of shapes and sizes and are manufactured using various materials. Here are some of the breathable components used in cooling pillows. 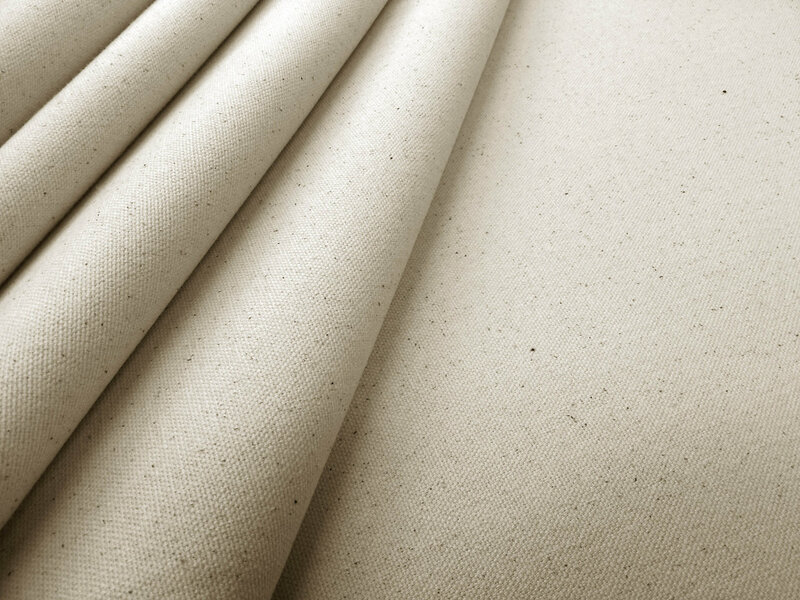 Natural fabrics: They may not seem like anything special, but natural fabrics like cotton and bamboo are highly breathable. This is one reason that our clothes are commonly made from them. Many cheaper pillows are made from synthetic materials that mimic the comfort of natural fabrics. They may feel similar to the touch, but natural materials are more breathable and cooler than their synthetic imitators. 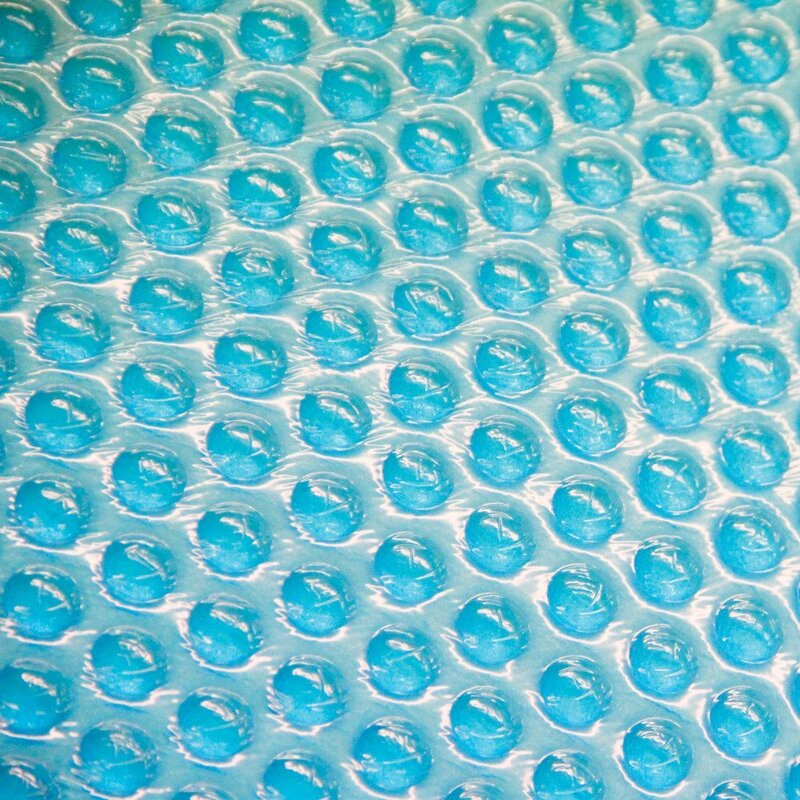 Gel: Gel and gel foam are very popular cooling materials because they have the ability to pull heat away from the body and keep it from the surface of the skin. Gels usually stay at room temperature, so they may not be as effective on hot nights if a sleeper doesn’t have air conditioning. 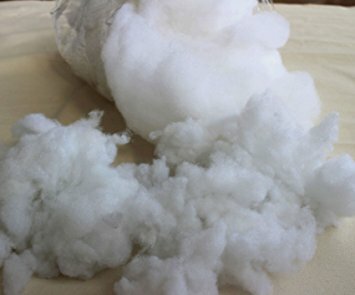 Fiberfill: Fiberfill stuffing is a synthetic material that is lofty and meant to retain its shape. The fiber is very breathable, and because of the loftiness of this type of pillow, air can easily flow through. Fiberfill pillows are less dense than foam pillows and are therefore naturally more breathable. However, they may not have the support some sleepers need. Ventilated foam: Ventilated memory foam and latex foam are a solution to the lack of breathability of otherwise comfortable foam pillows. Small or large punctures are made into the foam to increase breathability. Because these foams are very dense, support is not sacrificed. Latex foam is typically preferred over memory foam for breathability. It’s important to remember that a cooling pillow alone may not solve the problem of overheating or waking up hot. A high-quality cooling pillow covered by a non-breathable pillowcase will be rendered completely ineffective. It’s important to use a natural cotton (or other breathable fabric) pillowcase with a low thread count in order to enjoy the benefits of a cooling pillow. It’s also necessary to control the temperature of the bedroom. Cooling pillows do not emit cold air. They simply help to diffuse natural body heat. If the temperature in a room is very high, a cooling pillow won’t do much. For more serious issues with overheating, a sleeper will need to consider a cooling mattress. There are many good reasons to buy a cooling pillow, but there may be some drawbacks as well. This will depend on sleep style and preference for comfort. Here are some of the pros and cons of cooling pillows that were taken from real customer reviews. 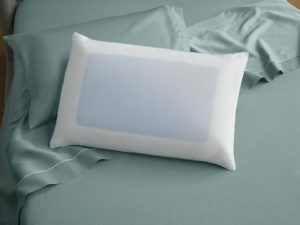 Sleep cooler: A cooling pillow should help diffuse body heat and feel cool to the touch all night. Comfort: Cooling materials like foam and gel are usually very comfortable. Save money: You won’t need your air-conditioning to be on as high when using a cooling pillow. It will also prevent you from sweating at night, which will increase the life of your mattress and bedding. May not solve other problems: Cooling pillows are not a cure for all sleep problems. If you’re having other issues such as aches, stiffness or allergies, you’ll want to choose a pillow that addresses these issues as well. May be heavy: Foam and gel pillows can be much heavier than normal pillows. This can make them difficult to move or flip throughout the night. May be too lofty: Loft can increase breathability, but it may be detrimental to spinal alignment, especially for stomach sleepers. 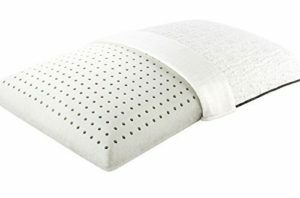 What type of sleeper should consider a cooling pillow? Anyone can suffer from sleeping hot. Some only suffer from time to time or during hot parts of the year, while others wake up sweating on a nightly basis. A doctor should be contacted if frequent night sweats occur. Otherwise, a cooling pillow can help to alleviate some of the discomfort. Sleeping hot is a common problem with heavier sleepers (sleepers who weigh over 200 pounds). This is because heavier sleepers cover more area and emit more heat than lighter sleepers. They also tend to sink deeper into a mattress or pillow. Being surrounded by a non-breathable material can make a bed feel like a furnace. 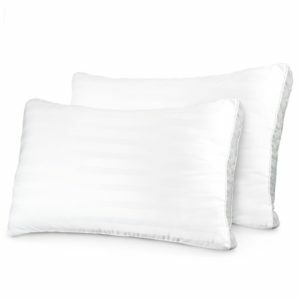 Heavier sleepers who experience discomfort should consider a cooling memory foam pillow. This will help to increase breathability without sacrificing the support that heavier sleepers need. Some sleepers have trouble sleeping hot when they share the bed. An extra body in bed increases the heat two-fold and can create problems for otherwise happy couples. Something as simple as a new cooling pillow can do wonders for couples that have differing sleep preferences. Those who toss and turn at night but don’t necessarily feel hot may still benefit from a cooling pillow. The American Academy of Sleep Medicine has suggested that cooling the head can assist in relieving insomnia. In their study, about 75% of the subjects who were able to cool their foreheads at night slept better. Those who suffer from insomnia may want to choose a cooling pillow that comes with a sleep-trial. This would provide a risk-free opportunity to see if this type of pillow can help. Our guide to the best cooling pillows was compiled after exhaustive research by our experts. The conclusions they drew were based on real-life experiences, consumer reviews, and manufacturers’ data. All of our top picks for cooling pillows may not be appropriate for everyone. Make sure to read our complete Guide to Pillows to find out which type of pillow is right for your sleep style. Then you’ll be ready to choose the right cooling pillow. Tempur-Pedic is the best-known memory foam mattress and pillow producer in the USA. They make products of consistent high-quality, and this cooling pillow is no different. The Tempur-Pedic TEMPUR-Cloud Breeze Dual Cooling Pillow combines Tempur-Pedic’s supportive memory foam with two layers of cooling gel and a breathable cotton cover. Memory foam is known for being one of the least breathable materials, which can be frustrating for those who need its excellent support but also sleep hot. The TEMPUR-Cloud Breeze has attempted to solve this problem, and customer reviews show that it’s done so successfully. 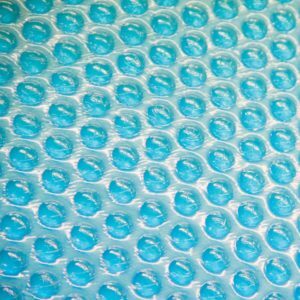 The two layers of cooling gel simultaneously pull heat away from the body and prevent the memory foam below from absorbing it and heating up. Great cooling for memory foam: Most cooling memory foam pillows are not able to completely eliminate heat, but the TEMPUR-Cloud Breeze is reported to sleep as cool as the best non-foam cooling pillows. Excellent support: Along with the cooling benefits, the TEMPUR-Cloud Breeze provides excellent support for the head, neck, and spine. Removable cover: The TEMPUR-Cloud Breeze comes with a cotton cover, which is easily removable and machine-washable. Warranty: The Tempur-Pedic cooling pillow comes with a 10-year limited warranty, which is higher than the industry standard. If you’re interested in the Tempur-Pedic TEMPUR-Cloud Breeze Dual Cooling Pillow, you can find out more or make a purchase at Amazon. The Beautyrest Black Diamond Luxe Ventilated Pillow is a luxurious cooling pillow. It’s more expensive than most other pillows, but if you find yourself waking up hot very often, it may be worth the price. This pillow uses exclusive conductive microdiamond technology and soft, ventilated memory foam to pull heat away from the body. For a memory foam pillow, this is one of the most breathable and comfortable options. Sleepers who love the cradling support of memory foam but are unable to compromise when it comes to heat retention should consider investing in this pillow. The Black Diamond Luxe is also a good option for those who enjoy memory foam but don’t like the feel of gel. Stomach sleepers and more petite sleepers may want to avoid this pillow as it is quite large and may not be ideal for their for spinal alignment. Unique foam design: The Black Diamond Luxe is made from Air-cool max memory foam, which is specifically designed to pull heat from the body. Great support: This pillow has the support that would be expected from a high-end memory foam pillow. It has received especially high marks from side sleepers. Soft, washable cover: The Black Diamond Luxe comes with a stretch-knit cover that is soft and breathable. It can be removed and machine-washed. Lightweight: The Black Diamond Luxe is lighter than other memory foam pillows. The BeautyRest Black Diamond Luxe Ventilated Pillow is available now from Amazon. 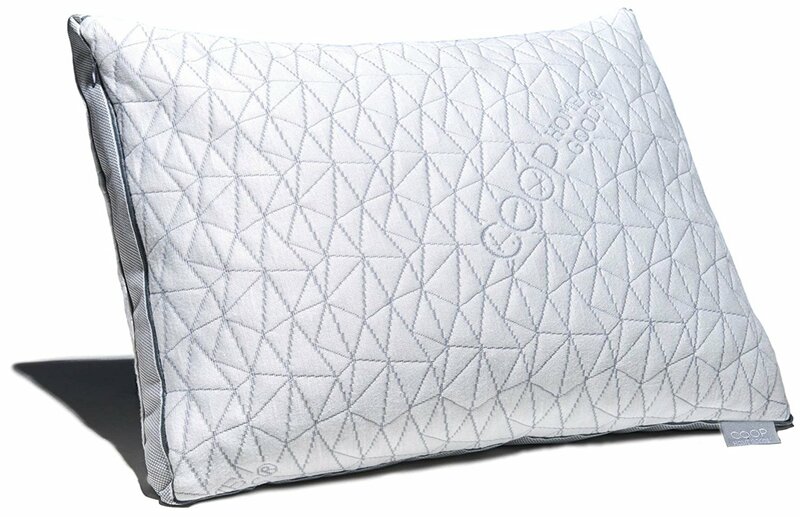 The Coop Home Goods Eden Pillow is one of the highest rated pillows on Amazon and one of the more affordable cooling memory foam pillows. Its shredded memory foam filling provides a cool yet supportive comfort that fits the contours of a sleeper’s head and neck. One unique aspect of this pillow is its dual-cover system. A bamboo and polyester outer cover provides optimal breathability from natural fibers, while the inside polyester cover creates a barrier that lets air flow between the sleeper and the foam filling. The Eden pillow is suitable for all sleepers. It is an adjustable pillow, which means filling can be added or removed to change the loft and firmness. Back and stomach sleepers who wish to try memory foam may want to consider the Eden, as non-adjustable foam pillows may prove too lofty for these sleepers. Gusseted support: The Eden pillow is made from shredded memory foam gel, but its gusseted design ensures the foam will never bunch or clump up. Adjustable: Choose the desired density and loft by adding or removing foam. Hypoallergenic: The Eden pillow is made from hypoallergenic materials that are resistant to harmful allergens such as dust mites. 100-day sleep trial: The Eden comes with a 100-day, money-back guarantee. No questions asked. If you’d like to buy the Coop Home Good Eden Pillow, or if you’d like more information, visit Amazon. The first fiber-fill pillow on this list is also one of the most popular on the market. 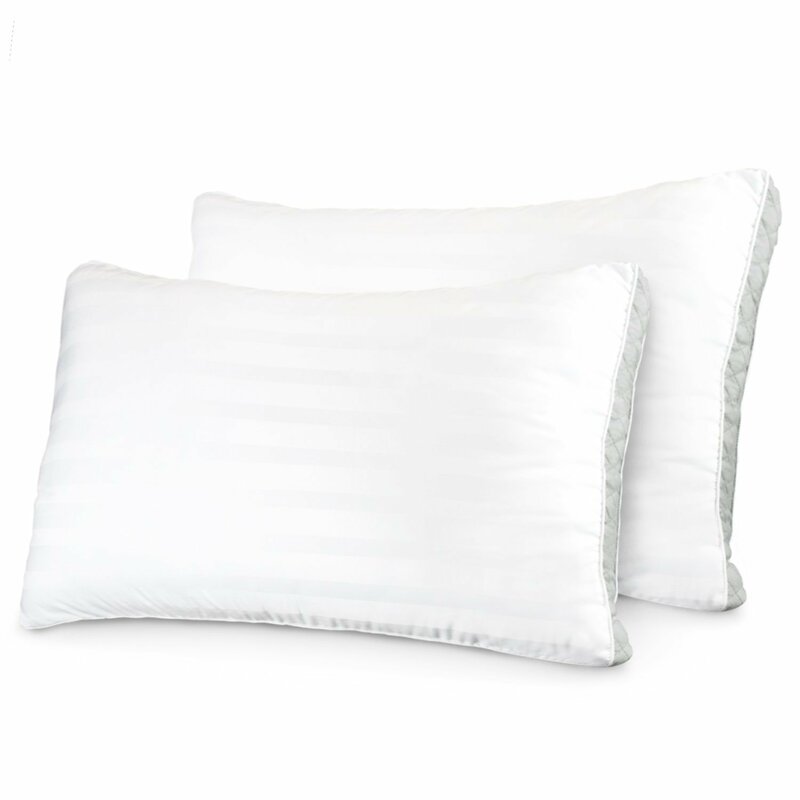 The Sleep Restoration 1800 Series Gusset Gel Pillow is a very plush and comfortable option that sleepers who prefer a low loft will appreciate. Unlike most fiber-fill pillows, the 1800 Series is stuffed with a special gel fiber that increases the cooling capabilities and soft comfort. This pillow is also gusseted to prevent the filling from moving around and bunching. Sleepers who have reviewed this pillow say that it is extremely soft and comfortable. Those who enjoy a cloud-like pillow with low density should consider the 1800 Series. Sleepers who suffer from neck pain or tension may need to consider a firmer option. Cool comfort: The 1800 Series is not firm like other foam pillows, so it remains as light and breathable as it is soft. Hypoallergenic: It isn’t common for fiber-fill pillows to be completely hypoallergenic, but the 1800 Series guarantees that it is impermeable to intruders. Machine washable: The entire pillow is machine washable. This is not the case with most other cooling pillows. Affordable: The 1800 Series is significantly cheaper than other cooling pillows, making it a risk-free buy. If the Sleep Restoration 1800 Series Gusset Gel Pillow seems like a good fit for your sleep style, order yours today on Amazon. 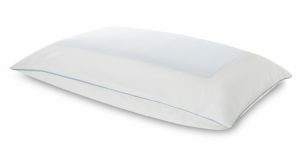 The ViscoSoft Arctic Gel Contour Pillow is an affordable memory foam pillow with some unique features. This pillow isn’t filled with gel foam but is actually covered with a thick layer of cooling gel. As the entire pillow is covered in gel, there is no part of the interior memory foam that can absorb any body heat. 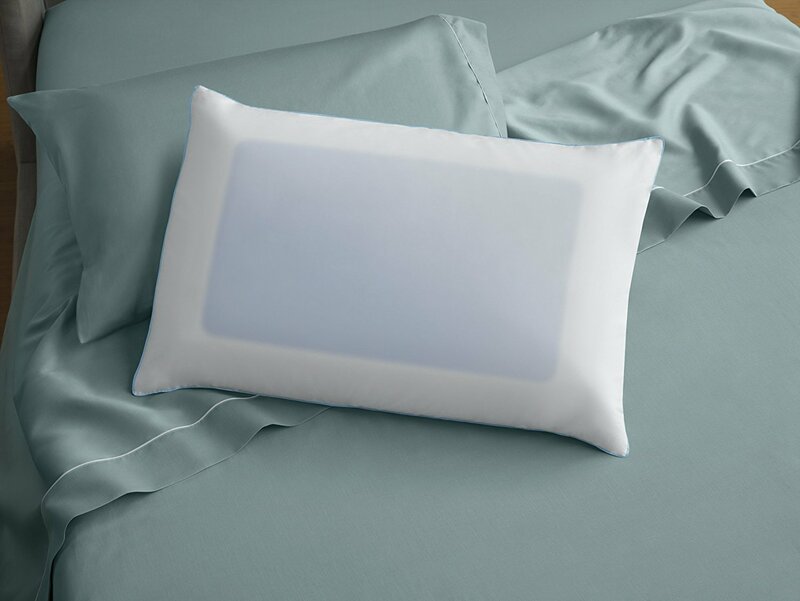 The Arctic Gel pillow is covered with a hypoallergenic, moisture-wicking and breathable cover to add to its cooling properties and provide sanitary benefits. The Arctic Gel Contour pillow is a dense memory foam pillow and is not as soft as other pillows on this list. Sleepers looking for firm contour support from a cool pillow will be happy with this option. Those looking for a plush pillow with some bounce will want to look elsewhere. Classic memory foam feel: Those looking for the classic memory foam feel (without the heat retention) will not be disappointed with the Arctic Gel Contour pillow. Extra-cool gel: The Arctic Gel Contour pillow contains 30% more gel than other pillows of its kind. Versatile cover: The washable cover is made from COOLMAX fabric, which is cooling, hypoallergenic, and moisture-wicking. Warranty: The Arctic Gel Contour pillow comes with a 30-day money back guarantee and a 3-year warranty. 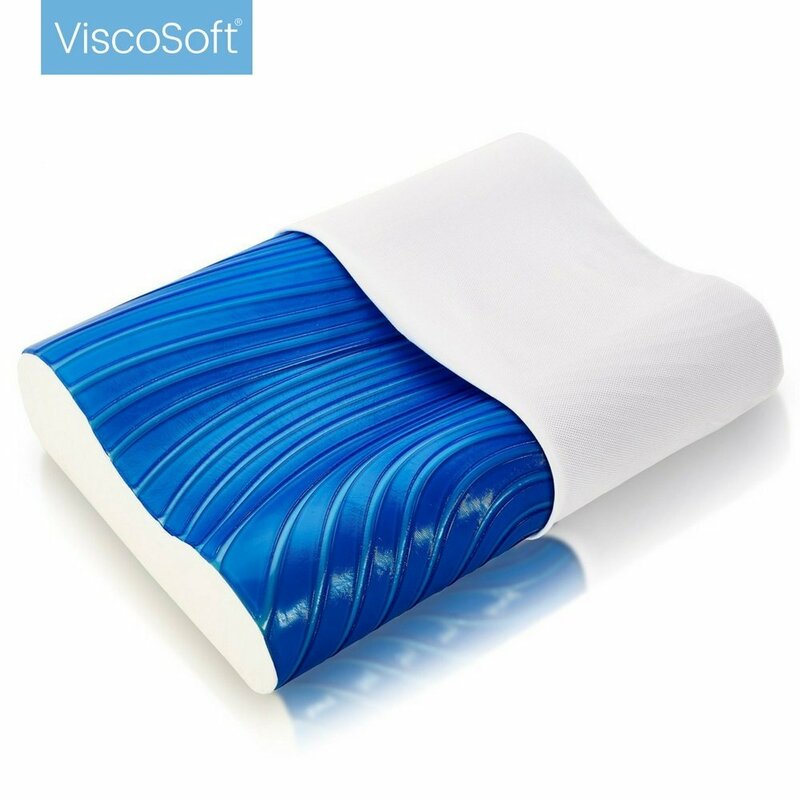 Head over to Amazon to buy the ViscoSoft Arctic Gel Contour Pillow if a cooling gel-coated pillow is what you need.